loved the jewellery..and the quality of the product. 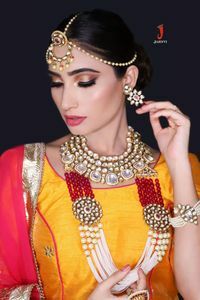 I was skeptical about choosing jewellery there but on wedding when jewellery was delivered it was above my expectations and finishing was so good. I wanted a beautiful nath they gave me two options in box without asking. I'm glad I chose jewellery from there store. Jaanvi is a place..which will make your special day...perfect..if you have anything in mind...Seema will just go out of the way and give you exactly what you want..she will improvise her jewellery or even make a special piece ..so as to make you day a perfect one...I have loved her..coz I had a list of the kind of jewellery I wanted..and she just did everything perfectly for me... Not just bridal..even if I like something of her stock..she is the one..who courierd me...she is the one whom you can blindly trust upon.. It is rightly said that jewellery has the power to be this little one thing that can make you feel unique and look different...!! Thank you jaahnvi for making me feel unique and look different by wearing your piece of art-jewellery!!. Very classy collection,so tempting. felt like buying all the products. 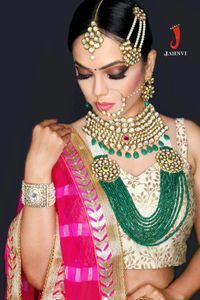 Jaanvi is just a perfect place to find out jewellery that matches your imagination. It serves good quality and reliability. Seema Di is a heartiest joyful lady and helps wholeheartedly to give us the best suitable jewellery. Work of excellence is called Jahnvi. Wide variety of range, you ask and it's available. Best quality, and best service provider. They match your choice with your outfit and make it look like that piece of gem is just made for you. In love with the products. Get best quote from Jaahnvi and book your date! Check their prices and availability. Send enquiry to your selected list of Wedding Jewellery at WedMeGood and choose the best. 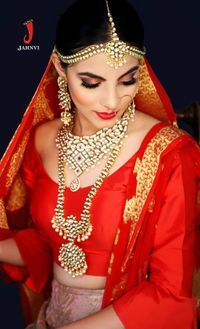 Browse for more Wedding Jewellery in Indore and more wedding vendors at WedMeGood and plan your wedding hassle free.